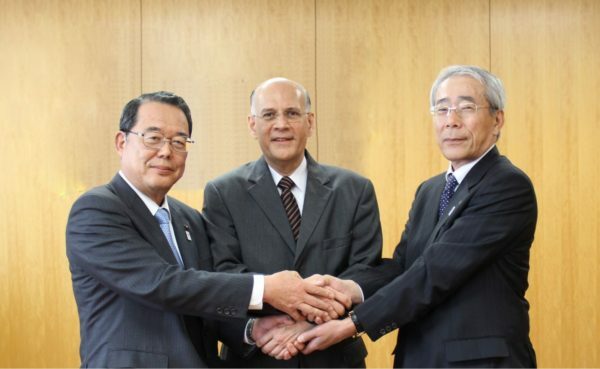 Kariya (Japan) May 9, 2013 – Toyota Boshoku Corporation (President, Shuhei Toyoda) has concluded an agreement to establish a joint venture in Pakistan with Pakistani automotive component maker, Thal Limited (CEO, Asif Rizvi) and Toyota Tsusho Corporation (President, Jun Karube). The new company, THAL BOSHOKU PAKISTAN (PRIVATE) LIMITED, will manufacture automotive components and is Toyota Boshoku group’s first production base in Pakistan. Pakistan’s population continues to increase and is an attractive market for the automotive industry as production of automobiles is expected to expand exponentially. Recognizing the potential of Pakistan, Toyota Boshoku group is proactively setting up a new production structure. Until now various Toyota Boshoku group companies produced and supplied seat frame components and air cleaners to Pakistan. One portion of production processes will be transferred to the new company and production will start from July 2014. In the future, the new company aspires to expand business to include seat assembly. By participating in this new venture, the Toyota Boshoku group is seeking to further optimize production and distribution in the Asia and Oceania region, which is a crucial market. Toyota Boshoku will continue to offer customers worldwide appealing, comfortable and safe automobile interior spaces.